this UP NHM Staff Nurse, Nursing Sister and other jobs. Eligible candidates submit application form online or this Uttar Pradesh State health Society vacancies under UP NHM. Online application form submission closing date is 14-10-2018. Written exam will be conducted on 04-11-2018. Official website to apply online is www.sams.co.in. For more details regarding this UP NHM State Health Society Recruitment of Staff Nurse, OT Technician, Laboratory Technician and Nursing Sister jobs selection process, documents to upload online, exam pattern and syllabus, qualifications and other details are given below. There are total 936 vacancies in this State Health Society of Uttar Pradesh National Health Mission recruitment 2018. Post Name and No of posts details are given below. For PH candidates additional 10 years will be given. No fee for this UP State Health Society jobs. 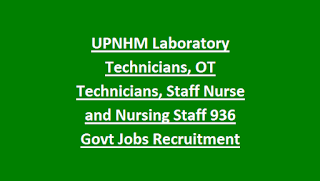 For OT Technician Jobs in UP NHM-B.Sc or Diploma in Operation Theatre Technology with 1-3 years of work experience. Candidates selection will be held based on merit in written exam for all the posts of UPNHM recruitment 2018. Based on merit in written exam candidates will be called for documents verification. Written Exam will be held on 04-11-2018. Written exam will be objective type and it covers the basic general concepts of General Knowledge, General English, General Hindi and Subject knowledge of Diploma or Degree level. 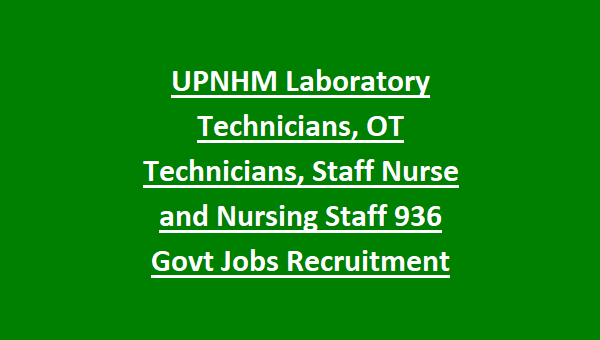 Apply online for this UP NHM Jobs Recruitment of OT Technician, Staff Nurse, Nursing Sister and Laboratory Technician Posts. Online applications will be accepted through official website of Up NHM @ www.sams.co.in. Last date for apply online is 14-10-2018.